I was inspired to create this favorite blend of seasonings when my family raved about a Taco Soup served at a church potluck one Sunday afternoon. After asking my friend for the recipe, I realized it was one that used so many packaged seasoning blends and canned goods that one recipe could feed an army. I rose to the challenge and set out to dissect the ingredients for each of those seasoning packets and set out to create a recipe that made just enough soup for one family at a time. This is still one of the few meals my pickiest eater will always get excited about! MAKE IT A SOUP MIX: I like to keep several bags of single use mixes on hand to whip up a fast batch of Taco Soup on a busy day. My ‘picky eater’ can make this on his own more easily when I have a bag he can just cut open and pour into a pot with the liquid ingredients. I print the soup recipe and place it in the basket where I store the bagged blends so everything I (or he!) need to know is right there. Leftovers of this soup make a great baked potato topper! For this reason I like to make a double batch and plan a meal trail that week. Split open the baked potato and use a slotted spoon to scoop out the reheated taco soup, getting a generous portion of the vegetables and optional meat, but very little of the broth. Top with a generous portion of shredded cheddar and some sour cream and enjoy a delicious meal with the family! 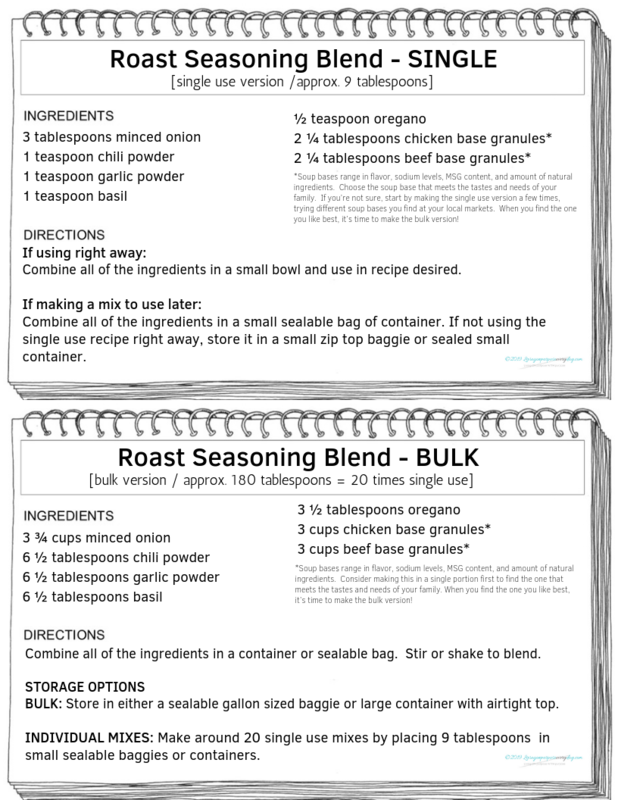 This blend was created when I wanted a less costly answer to making a large roast in my slow cooker. I grew up using a store bought seasoning package, but when I made a roast large enough to satisfy my growing family, it required several packets, making it too costly for my small budget. A bonus was that the blend I created was much more flavorful than what came from that store bought package. I also found that by making it in bulk I could afford to use it in a variety of ways. It’s no longer just for roast! We turn to this blend when cooking chicken, pork, soups and stews, or to season some vegetables, like green beans. It also makes a great dip by just mixing it up with some sour cream. This recipe is one that is best made in bulk. It allows you to have seasoning on hand for any of the recipe variations found on the blog. It’s easy enough to scoop out a tablespoon at a time and keeps your pantry filled with quick mealtime solutions! *A key ingredient in this recipe is a dry soup base. Soup bases range in flavor, sodium levels, MSG content, and amount of natural ingredients. Choose the soup base that meets the tastes and needs of your family. If you’re not sure, start by making the single use version a few times, trying different soup bases you find at your local markets. When you find the one you like best, it’s time to make the bulk version! Use the search bar or the category menu in the footer to find recipes using this blend. Just search or click ‘Roast Seasoning Blend’.